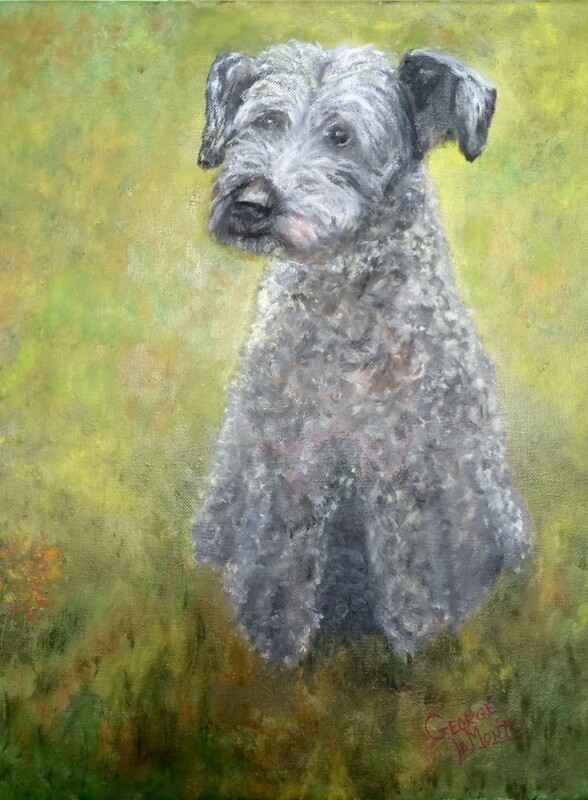 Macho Guy and I experience many moments of melancholy since our fur baby Dickens crossed over The Rainbow Bridge in April. The house is so quiet without him. Whenever someone went by outside, Dickens would run to the kitchen window and bark at the potential intruder. Then he would run to the glass paneled front door and growl at the sinister pedestrian. Finally, he would dash down the hallway into our bedroom and leap up onto the window seat and bark and growl at the perceived villain from the bedroom windows. After he barked and growled himself hoarse, he would jump down and trot back into the kitchen and guilt me into giving him a treat as a reward for terrorizing the aforementioned axe murderer. Summer just wasn’t the same without him. 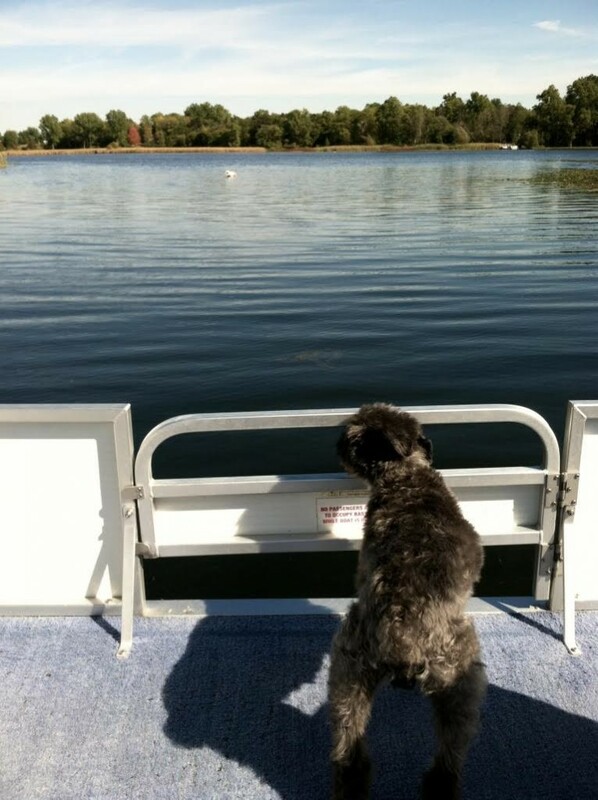 Dickens loved riding on the lake in our pontoon boat with us. He loved the boat but hated the water. He especially loved to stand up front with the wind blowing in his face. We always took snacks and drinks with us, and we took treats for Dickens too, of course. He wasn’t much of a gardener but he loved being outside with us and he poked his nose into everything. He also loved wandering off to play with our neighbor’s dogs without letting us know so we’d have heart failure thinking he ran off and we’d never find him again. Fourth of July was definitely a challenge for Dickens. Fireworks terrified him, so we’d shut the blinds, crank up the stereo, and keep him inside so he wouldn’t see or hear anything. Halloween wasn’t the same without him this year either. 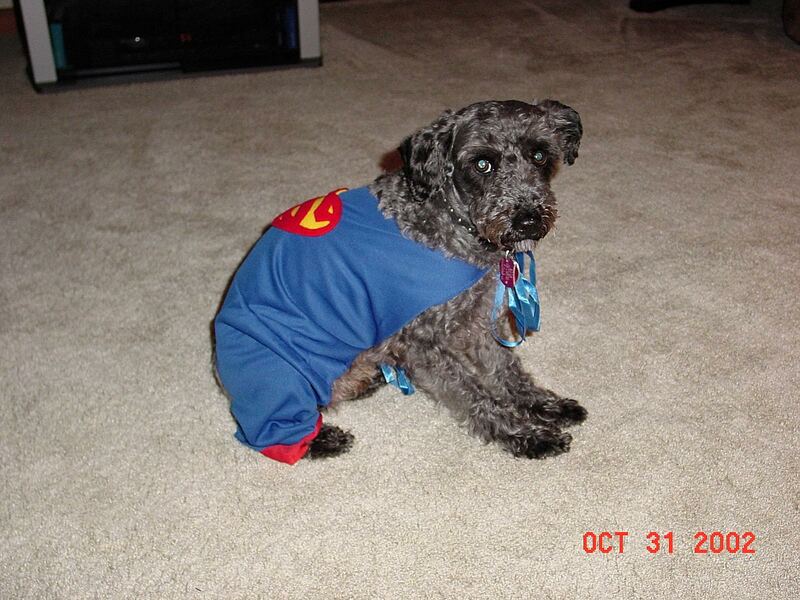 I always dressed him up in a costume—as Superman or as a sailor—and he looked so adorable helping MG and me hand out the candy. He scooted to the door ahead of me the instant he heard the Trick or Treaters scampering up our driveway. He barked and wagged his tail in greeting when they rang the doorbell. He wagged his tiny tail so hard his whole hind end wagged along with it. The kids always made a great big fuss over him and he lapped it up. On a nostalgic impulse, I brought his tin of ashes out to the foyer and set it out so he could be with us in spirit to great the Trick or Treaters. Just writing about it made me tear up just now. Thanksgiving will be different too. In a few days, we’re driving down to North Carolina to spend Thanksgiving week with our Firstborn and his family. 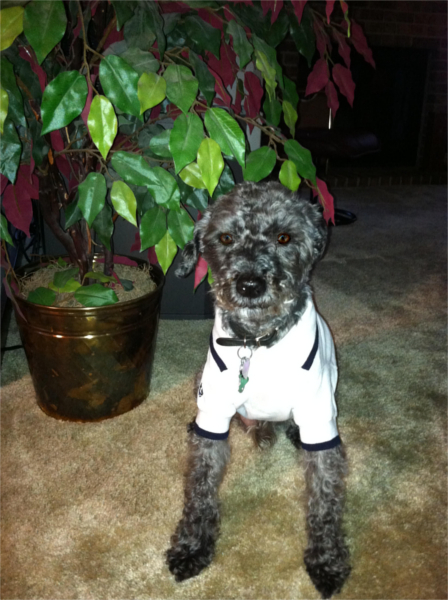 This is the first time since Dickens became part of our family that he won’t be traveling with us to visit them. He also won’t be traveling with us when we head south for our winter vacation. Both will be lonely trips for us. We always stayed in pet friendly accommodations on the road with Dickens. He was very well behaved so long as we didn’t leave him alone in a hotel room. For some reason being in a hotel room alone bothered him. He once tried to dig his way out of one. We never left him alone after that. 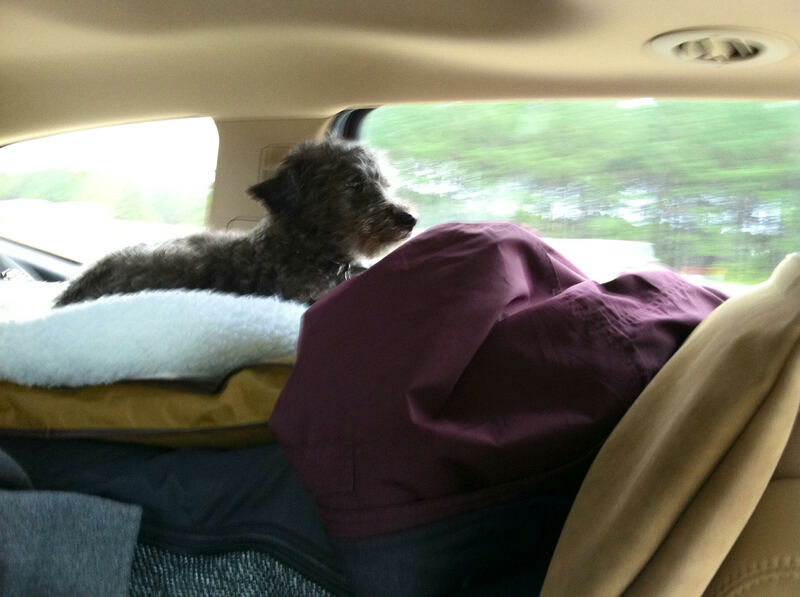 He loved riding in the car, and he was a good little traveler—except when he would scale the mountain of luggage and coats piled on the seat beside him. He loved the vantage point from the summit of the luggage mountain. I’m feeling especially sad and missing Dickens more than ever this week because my heartbroken baby sister lost her fur baby a few days ago. He was part of a litter named for famous rock stars—he was tagged as Jerry Garcia, just plain Garcia for short. 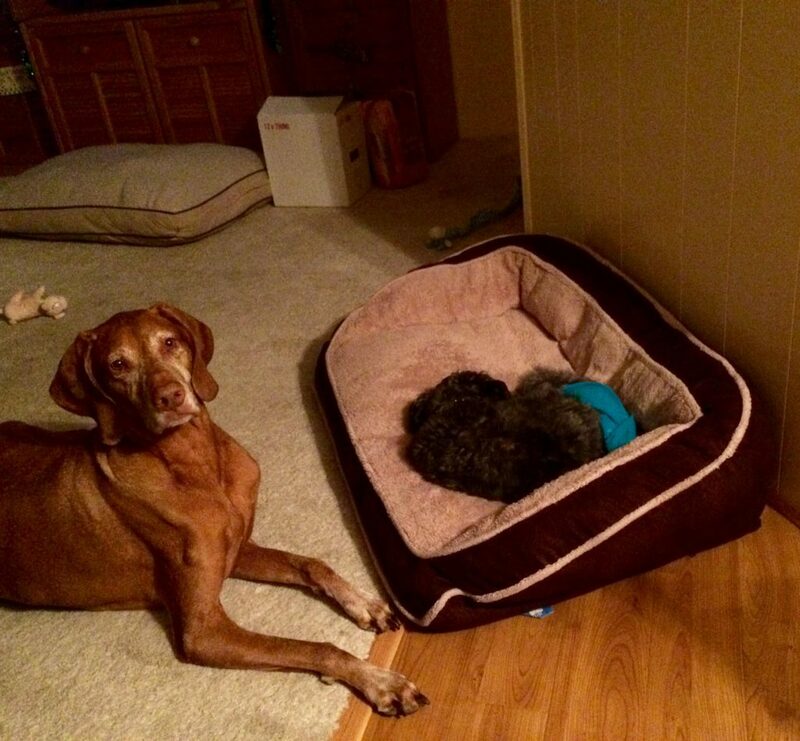 Garcia was a very sweet, affectionate vizsla and had only recently turned nine years old before he became ill. He and Dickens were good buddies. They had a great time playing together despite their size difference. Whenever we visited, Dickens would commandeer Garcia’s favorite bed. Garcia was always very tolerant and the perfect host. He never evicted Dickens from his bed. Probably the funniest incident that took place was on the day that Garcia saw me cuddling Dickens on my lap while we were in the kitchen after having breakfast. 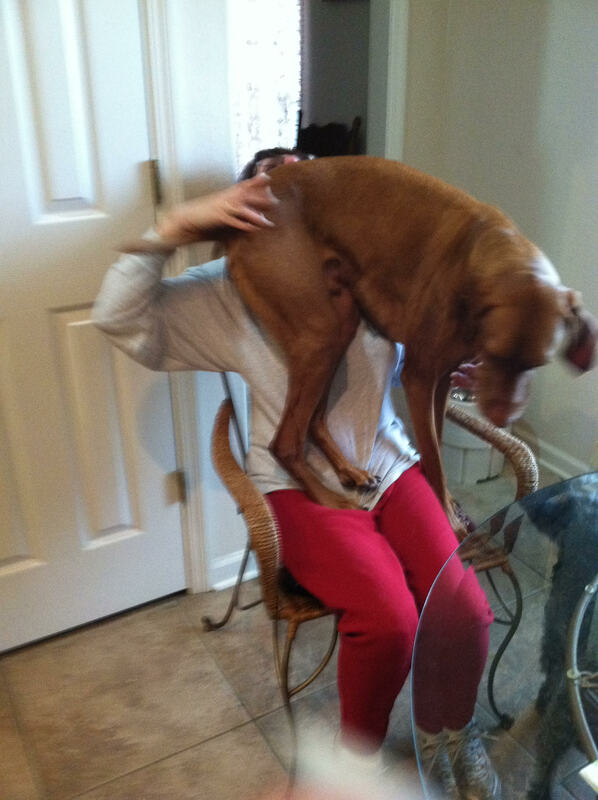 Seeing Dickens and me must have inspired Garcia to be a lap dog too, because he clambered up onto my baby sister’s lap with hilarious results. I snapped a photo of the two of them and it never ceases to make me laugh. I like to think that Dickens was waiting on the other side when his buddy Garcia crossed over the Rainbow Bridge, and that they are now playing together once again, pain and illness free. So sad to lose such good friends. Nice at least to know the two friends are now together though. It sure is comforting, Margo.